To see these menus, click on the Open... button on the main "Your Puzzles" display. Here you can see details of some of the puzzles players have made. Puzzle summaries are shown side by side. If there are too many to fit in the display, there will be a scroll bar across the bottom. The headings are down the left hand side. Click on any heading to sort the puzzles by that item. Click a second time to sort in reverse order. 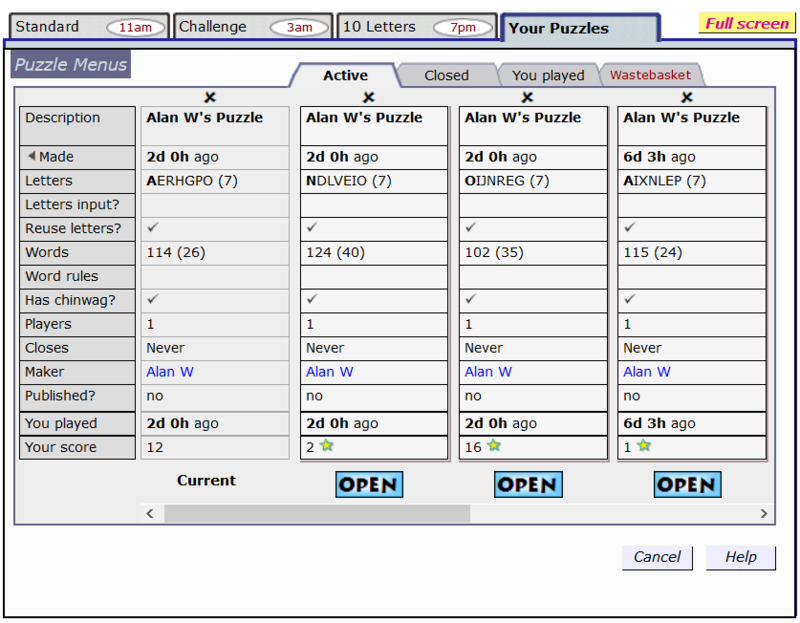 The tabs at the top right allow you to choose between four menus of puzzles: Active, Closed, You played and Wastebasket. Active puzzles are ones that have not closed yet, including ones that never close. The puzzles you have made will be here, together with other puzzles that have been published by their makers. These puzzles are initially ordered according to when they were made, starting with the most recent. Closed puzzles are ordered according to when they closed, starting with the most recently closed. Under the You played tab, you can see the puzzles you have played, ordered according to when you last played them, starting with the most recent. Under the Wastebasket tab are puzzles you have discarded (deleted). To retrieve a puzzle from the wastebasket, just open it and start playing it. To play one of the puzzles shown, press the "Open" button under its details. You can also open a puzzle by double-clicking anywhere in its details. If you don't like a puzzle you have made, you don't need to do anything to get rid of it - you can ignore it and it will go away after a while. But if you have unwanted puzzles cluttering up your menu, you may be able to discard them. Any puzzle you have made, but not published, has an icon above it that you can click to discard it. This transfers the puzzle to the Wastebasket menu. If you move the mouse pointer over the items in the puzzle menu, many of them display an expanded description. Description: The description the puzzle maker gave. Letters: The letters of the puzzle, with the mandatory letter first, in bold type. The number of letters in the puzzle is shown in brackets. Letters input? Were the letters of this puzzle input by the player who created the puzzle? Reuse letters? Is this a "7-by-many" puzzle where letters can be used more than once in a word? Words: The total number of words possible, with the number of common words in brackets. Word rules: The word "censored" will appear here if this puzzle was created with the option that excludes words (expletives and epithets) that might cause offense to some players. The word "plurals" will appear if the puzzle allows all plurals and verb inflections ending with S.
Has chinwag? : Does this puzzle have a chinwag comment board beside it? Players: How many people have played this puzzle so far. Blinking green dots after the number of players tells you how many people have been playing in the last few minutes. Closes: When does this puzzle close, if ever. Maker: The player that created the puzzle. If the player is registered, you can click their name to see their profile, as you can on the scoreboard. Published? : Has the puzzle been published, and if so, to whom? You played: When did you last play the puzzle, if ever. Your score: Your current score for this puzzle.